Lagos — The second edition of “Hope For Girls”, a basketball clinic, for girls came to a befitting end Sunday at the Rowe Park, Yaba, Lagos. 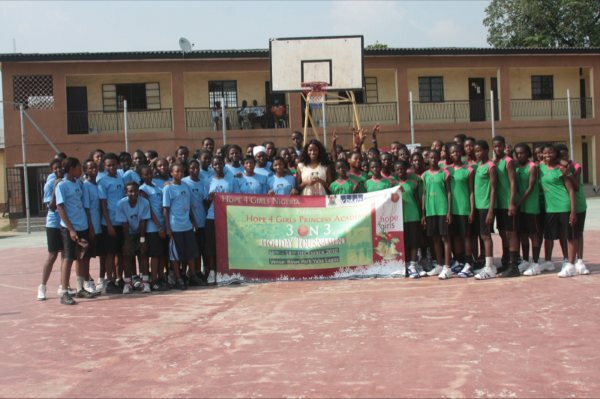 The annual programme, which is the brainchild of America based former Nigerian international basketball player, Mobolaji Akiode, started last week with about 50 girls who are under 20 years of age. Also, 150 secondary schools from different states of Nigeria plus also girls from Benin Republic and Mali attended the clinic. Hope For Girls was set up primarily by Miss Akiode to empower girls from poor family backgrounds but who have the potential of making it in life through basketball. Her goal was both simple and grand: to use sports, particularly basketball camps, to inspire and empower impoverished young women, first in Nigeria and then throughout the African continent. “Women are seen as second-class citizens in most parts of the continent. But in reality, this is not so. Women can excel in areas where men do. Akiode began noticing the disparities during visits to Nigeria while she was a member of the national and Olympic teams. “I just got heartbroken when I saw that things that helped me as a young girl are no longer in place,” she says. Rowe Park, which served as venue for the one-week camp was a beehive of activity all through the event. There were three sessions daily in the mornin and evenings for campers and secondary school kids. These included seminars, self-defence class, a motivational speak from Mr Saheed Kekere Ekun and career talk by educationist, Mrs Catherine Bickerseth of Strategic Educational Advisory group. At the end of the event, participants expressed appreciation to Miss Akiode and wished all Nigerians would join hands with her in giving hope to a lot of girls who are in the streets. Miss Akiode who left her job as an accountant with ESPN to set up Hope For Girls in Nigeria has appealed to well meaning Nigerians, the corporate world and Non Govermental Organisations (NGO) as well as various levels of governments in the country to come to her aid to keep her pet project alive. “I’ve done my best making sure that some less privileged girls in our society don’t waste away, through this Hope For Girls camp. But how much longer I can carry on will depend on how much support I get from governments, the private sector and Nigerians generally. For now, I can thank my team who have supported me all the way, and I cannot forget the Lagos State Governor, Babatunde Raji Fashola (SAN) for his support.